Heroic Maps released another new map pack for your gaming needs. This time it's Gallow Lane Woods. 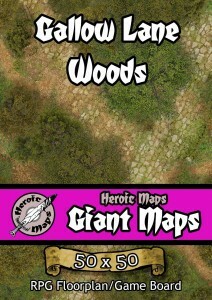 Contents: A forest map, with various sized muddy tracks and trails. Dense areas of forest and woods, with small clearings and rocky outcrops. A campsite in clearing with bedrolls, crates and a small fire, an ancient road cutting through the trees, with an older, less travelled road leading to an overgrown ruined building. Uses: The hideout of a group of bandits, mercenaries or freedom fighters, the haunted remains of an ancient church hidden deep in the forest, the Imperial Road - the last remnants of a once mighty empire now crumbling in the woods, encounters with bugbears, owlbears..and even regular bears.